British Literature Broad Notes Plays Restoration Era The Rivals Discuss "The Rivals" as an artificial comedy of manners mirroring the Restoration England. 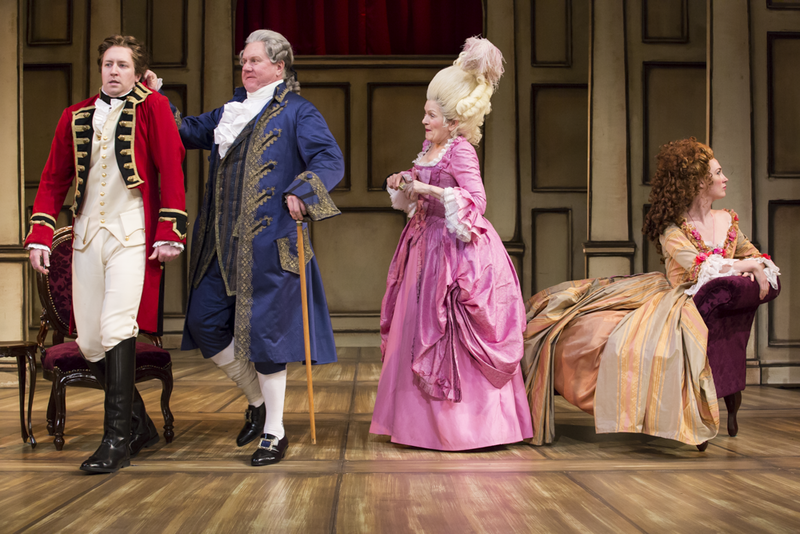 or Is the spirit of "The Rivals" in keeping with the reaction against the sentimental comedy prevailing in the age? Discuss "The Rivals" as an artificial comedy of manners mirroring the Restoration England. or Is the spirit of "The Rivals" in keeping with the reaction against the sentimental comedy prevailing in the age? The comedy of manners is a genre of play which satirizes the manners and affectations of a social class or of multiple classes, often represented by stereotypical stock characters. The Comedy of Manners had its origin in Ben Jonson's Comedy of Humours. It was called the Comedy of Manners because it did not aim at presenting the human nature but the manners of the particular society. It depicted the manners of the contemporary aristocracy with their elegance, fashion and vices, pomp and show, polished behaviour, all sorts of intrigues, gallantry, cultivation of wit and brilliant conversation. Like typical comedy of manners, The Rivals has a complicated plot. There are three love-affairs in it – the Absolute-Lydia love-affair, the Faulkland-Julia love-affair, and the Mrs. Malaprop-Sir Lucius love-affair. All these love-affairs have a parallel development, so that the interest keeps shifting from one love-affair to the other quite rapidly. Again, like a typical comedy of manner, The Rivals abounds in wit. We have the wit of Captain Absolute, the wit of Sir Anthony, the wit of even Sir Lucius and Acres who are otherwise the targets of the play’s satire. The portrayal of Lydia is a satire on the romantic notions which young, fashionable girls of upper-class families of the time entertained. She is fond of reading romantic novels and stories. Fed on such stories, she does not want a conventional wedding. When Captain Absolute’s real identity is revealed to Lydia, she feels terribly disappointed at the collapse of her romantic dreams and hopes. The portrayal of Lydia's “tough old aunt”, Mrs. Malaprop is also satirical. We laugh at the contradiction in this elderly woman who puts restrictions on her niece, while herself falling in love with a tall Irish baronet and writing letters to him under the assumed name of Delia. Beverley’s description of Mrs. Malaprop as an “old weather-beaten, she-dragon” is most amusing. The Faulkland-Julia love-affair is undoubtedly a parody of the sentimental comedy of the eighteenth century. Julia is portrayed as an excessively sentimental girl, while Faulkland is portrayed as the most whimsical and eccentric lover. Faulkland greatly amuses us by his account of the anxieties that fill his mind regarding Julia. Another important feature of the Restoration comedies is witty dialogue. In The Rivals, the verbal skirmishes between Sir Anthony and his son is one example of the kind. The manner in which Captain Absolute befools Mrs. Malaprop and Lydia is another example of wit. Right from the beginning to the end, the play sends the audience into peals of laughter. As a specimen of Comedy of Manners, the true spirit of comedy, fun and frolic, humour and wit and even boisterous laughter reign supreme in this play.